Ron Arnoldsen (left with the newly/partially planted living walls at Pattee/Paterno Libraries) started the interior landscape business in 1993; his first maintenance account was the Nittany Lion Inn at Penn State University. To date, it has grown to include many interior accounts in State College and central Pennsylvania. This interior landscape firm was the parent company of what has blossomed into a multi-dimensional business with an exterior landscape division (1996), and a pottery/art division (Earthen Art - 2004 ), an organic farm/products division (Blueming Gardens Farm - 2008), and our business at Penergy Solutions (2011) that creates liquid organic fertilizer from recycled food and farm wastes. The company has some founding principles that make it special: we believe in treating our employees as we would like done to ourselves; treating our customers as our friends; and doing business professionally, honestly, and lovingly. We respect the earth, the space we are given to use, and the abundances that are bestowed upon us. We strive to stay creative and productive, and always stay busy. We feel that we should leave the land better than when we got there and leave our caring touch on all that we do. We try to help our neighbors and friends whenever we can and aim to feed as many people as we can in a healthy and wholesome way. Lastly, we are fond of sharing with others. We were not put on this earth to merely make a living but rather to make a difference while doing so. We try to help others whenever we can in a meaningful way. We love to brighten the environments that we occupy on earth with our loving touch! We care about both the quality of work we do and the relationships with our clients. Many of our customers become our friends and follow our endeavors in life. We are master dreamers, for sure. The services we offer in our interior division are focused around houseplants and we are pleased to offer some custom options for orchids and flowering plants. 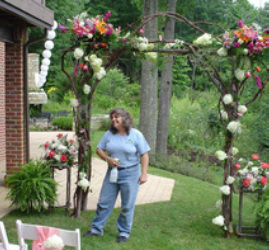 Our staff is also happy to do plant rentals and event decorating with plants and cut flowers. _Green Thumb Services visits your facility religiously each week to maintain the plants. We clean, water, trim, fertilize and freshen pot toppings, such as moss, bark, or cobble stones. After 25 years of experience in this specialized field, we are proud of the exceptional level of care that we provide for our customers. We also rotate plants for clients, switching plants to higher light levels on occasion for an added boost in photosynthesis. Plants are turned to be fuller and more uniform on occasion as well. We can also help to keep your silk plants clean. Our staff members are knowledgeable about indoor plant types and proper lighting levels, a skill required to keep your plants healthy and happy. _We offer design and installation of indoor plants and planter beds, including plant and pot selection. Our specialties include living plant walls, water features, and flowering plant programs. Some examples of our living walls can be seen at the Centre County Airport and Pattee/Paterno Libraries at Penn State University. We order our tropical foliage plants in from Florida and Canada; we install them in your facility from a small room or space where we can unwrap, clean, pack and stage them into their decorative containers. We have a large selection of plant containers that clients can select for us to order to meet their design wishes. Our design staff members have many years of experience and love to help customers to find the right plants and pots for their lighting levels and to fit in with their indoor furnishings and traffic flow patterns. Upgrades are also an option for those with existing pots and plants. We can also build specialty features to accommodate their decors such as vertical living walls and waterfall panels, indoor ponds, and waterfalls. Living Plant Wall and Water Wall combination installed at the Centre County Airport in State College PA; installed in March 2013, this photo shows how the plants look just after installation. The planting pattern in this lovely feature represents a branching pattern that might be found in nature and the four elements are represented in the different attributes found within the feature. A lighted granite waterwall adds a central focal point and adds relaxation and visual interest. The water lost through evaporation is re-filled through an automated fill device and the granite was specially imported for use in this wall. The kids just love it and the plants are thriving well in the wonderful lighting at the Airport. 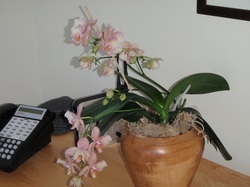 We offer a unique opportunity for customers to be able to enjoy a flowering orchid, in bloom at all times! We replace it when the flowers fade and put in a new flowering specimen to add a touch of elegance to the customers focal spot where it is displayed. Orchid types used include primarily Phaleonopsis and Dendrobium, but an occasional Cymbidium, Cattleya, or Oncidium are acquired and used whenever available. At special locations in a facility, vibrant potted flowering plants are kept in bloom, a special offering we call "color programs". We rotate new flowers whenever the previous ones start to fade, offering a wide array of plants, colors, and bloom types. It is a fun way to brighten a special place such as the reception desk at an office, reception table, or entryway at a home. The possibilities are endless. The types of flowers used vary with the season and availability, providing a constantly changing source of beauty. We offer custom floral designs and plant rentals for weddings, parties, company gatherings and special events. For wedding events and other special gatherings (such as birthdays, anniversaries, and retirement parties), we can provide fresh flowers in the form of table arrangements, vases, bouquets, corsages, boutonnieres, and cake decorations. Note that other structural specialties such as arbors, guest seating, and photo shoots are available. Custom pottery creations can also be ordered for keepsakes or wedding gifts, with advance notice. The bride and groom can also be a part of the creative process and help with their original wedding/party favors in several art forms such as clay, stained glass, living plants and pots. Plant setups can be rented for a day or more. Living plants with decorative pots strategically placed can add color and visual appeal for special business functions.